(Nanowerk News) Whispering-Gallery-Mode (WGM) microcavities that confine light in a small volume with high quality (Q) factors and enhance interaction of light with matters inside the cavity have shown promising applications as an element for a variety of devices such as micro-lasers, micro-sensors, micro-filters, and thus are becoming the basic building blocks of integrated photonic systems. This leads to tremendous progress in the development of micro-scale high-Q microcavity processing technologies. In a review entitled "Femtosecond laser 3D fabrication of whispering-gallery-mode microcavities" by Huailiang Xu and Hongbo Sun at the State Key Laboratory on Integrated Optoelectronics, Jilin University, recent progress in femtosecond laser three-dimensional fabrications of optical WGM microcavities was overviewed. 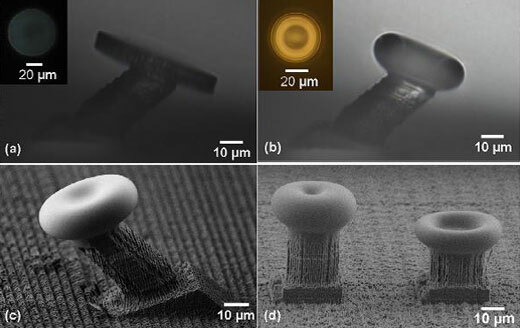 This review was published in SCIENCE CHINA Physics, Mechanics & Astronomy ("Femtosecond laser 3D fabrication of whispering-gallery-mode microcavities")). Femtosecond laser direct writing has attracted a lot of attention in recent years, and demonstrated the versatility in fabrication of a variety of devices from micro-fluidics, optoelectronics, micro-electronics, micro-machines, micro-sensing, to micro-biomimetics and micro-optics, etc. However, the reports on the fabrication of high-Q WGM microcavities appeared only recently. This review article began with a brief introduction of the basic principle of femtosecond laser processing, in which the 3D capability of high-quality micro-fabrication of femtosecond laser processing technique is discussed. Subsequently, the fabrications of 3D passive and active WGMs microcavities in a variety of materials including polymer, glass and crystals were demonstrated (see Figure 1). The fabrication of the integrated device of a micro-sensor incorporated with WGM microcavity was also introduced. They pointed out that fabricating microcavities with extremely high Q factors in the range of 108-1010 by using femtosecond laser direct writing is still challenging. However, "it is believed," the two researchers said, "the further effort on the investigation of femtosecond laser 3D fabrication of high-Q factor microcavities will undoubtedly benefit the applications of microcavities in a broad spectrum from bio-sensing and optoelectronics to quantum information".